The stunning new iPad Pro is thinner and more powerful than ever before. During today's Apple presentation, the manufacturer announced a completely overhauled iPad Pro with some truly significant alterations, including slimmer bezels and the removal of the Home button. 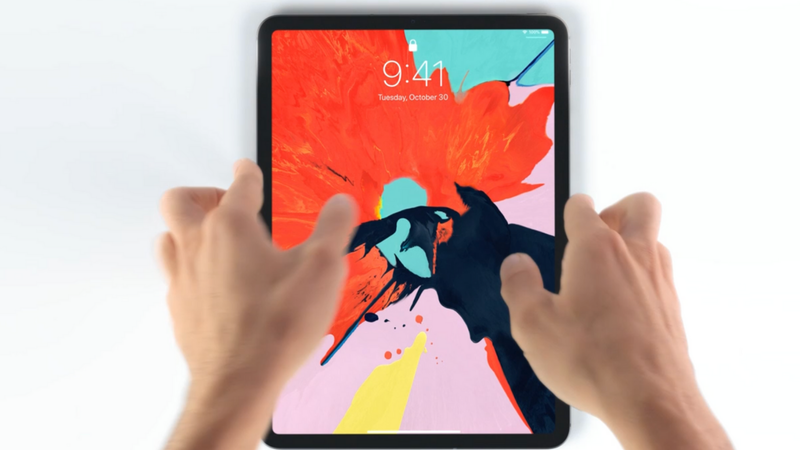 The new iPad Pro comes packing some truly impressive specs, with two screen sizes: an 11-inch option and 12.9-inch version with Face ID, a USB-C port, and a Liquid Retina Display. This particular version features the same TrueDepth camera setup that we first saw with the iPhone X, but it's notchless. Instead, you'l find the Face ID system in the top, flat bezel. This way, you can use Face ID horizontally, just like when you might connect it to a keyboard case. Powered by the new A12X Bionic chip as well as an 8-core CPU and 7-core GPU, it rocks 35 percent faster single-core performance and whopping 90 percent faster multi-core performance. The Apple Pencil hasn't been forgotten either, and you no longer have to insert it via the Lightning port to charge it – it stays on the iPad Pro with magnets, and the Apple Pencil is charged simultaneously. The 11-inch iPad Pro starts at $799 and the 12.9-inch starts at $999. They're available to pre-order today, and will show up in stores next week on November 7. The iPad Pro 10.5-inch will remain available alongside the current iPad lineup as well, if you don't want to break the bank with a new iPad purchase at the moment. I use my iPad for shack, Twitter, and Netflix. I feel like it might never need to be replaced.